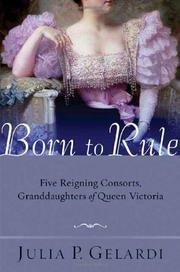 Laudatory concurrent biographies trace the intertwined lives of a quintet of princesses. For these comely royal cousins, all granddaughters of England’s dear, stately Queen Victoria, it was good—at least for a while—to sport coronets and kind hearts throughout Europe at the start of the 20th century. The five princesses ruled as Alexandra of Russia, Marie of Romania, Victoria Eugenie of Spain, Sophie of Greece, and Maud of Norway. For their thrones, the blue-blooded girls were obliged to adopt new homes, new religions, and new languages. With considerable use of private correspondence and related primary sources, independent historian Gelardi deals with more queens than you’ll find in a deck of cards. Naturally, there are kings too, and a few knaves: innocent Tsar Nicholas, Grand Duke Ernie, Prince Frank, the German Kaiser, and naughty King Carol. Tsarina Alexandra is mesmerized by Rasputin, then dies with her family at Ekaterinburg in the oft-told story. Unrestrained Marie cavorts with the smart set, the Astors, and a friendly fellow named Klondike Boyle. Queen Victoria Eugenie (“Ena” for short) deals with Generalissimo Franco. Along with marriage arrangements within the extended family, each memorialized with carefully formulated treaties, the story is marked by funerals, abdications, bombings, revolutions, world wars, and one royal palace lacking a lav or running water. The hereditary red thread of hemophilia surfaces from time to time as the narrative roves from Balmoral to the Winter Palace and the traditional role of the nobility fades. There were rewards, too; Gelardi notes the “paroxysms of elation” and “tumultuous greeting” of loyal subjects who were often “convulsed with excitement” at the sight of their sovereigns. But by the middle of the century, it was all over.